September can be a difficult month in the school system, as everyone (students, teachers, parents) gets used to new classrooms, new groups, and new expectations. 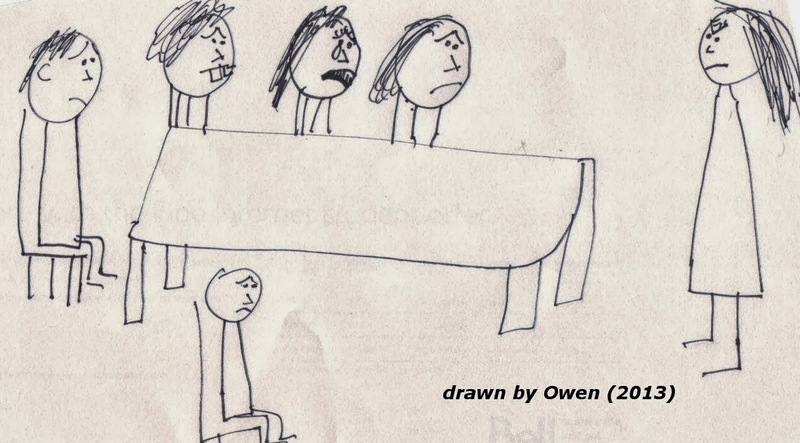 This picture, drawn by Owen (and used with his permission), for me perfectly encapsulates the feelings of distress and irritation that can develop on all sides of the classroom dynamic, especially during the early weeks of the school term. 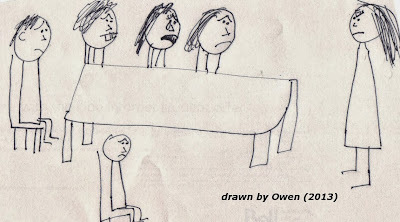 Owen drew his perspective for me, clearly showing that he felt his noisy classroom situation was not working out for him, but also not working for the other students and the teacher. During our discussion, we used clues and tried to "guess" what was in the minds of the other people in the situation. This helped Owen to understand why some of the other students might be distracted and having trouble settling down to work, also why the teacher might be finding it frustrating as well (trying to teach when people weren't focused and listening). It was important to him that I shared his drawn perspective with the teachers, so that he was sure they were aware of how upset he felt. This is a critical part of the problem-solving process, because anger and frustration are driven by feeling powerless to change a difficult situation. Finding out where your power is (what do you control?) gives a starting point for effective solutions. Essentially, you have direct control over everything that is connected to your brain - your thoughts/feelings, your words, your actions. Your words and actions may "influence" another person's choices (this is the world of social cues), but you can't control what another person chooses to do, say, think or feel. Owen is extremely noise sensitive and his ability to process spoken information in the presence of background noise is not strong. The classroom was noisy and several students were being disruptive. Owen was able to define his core problems as: (1) clearly receiving the teacher's lesson and instructions, and (2) being able to focus and do his work. Notice that all of these strategies have to do with things that Owen has direct control over in the situation - they let him know that he does have power to change things for the better. Even with the above solutions, this is a difficult on-going situation for Owen to manage (noise is a huge irritant that disrupts his thinking). Owen and I have known each other a long time, and he has confidence that I will act as his advocate and "go-between", explaining his distress to the other adults. He also has great confidence in the teachers at his school - they have helped him solve difficult situations many times over the years, and he is 100% certain that they "have his back".